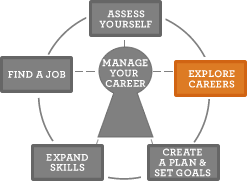 The Explore Careers section will help you learn about occupations. Do you know what your skills, interests and work values are? Then you are ready to explore occupations. If not, go back to the Assess Yourself section to find out more. You should know which occupations match your goals before you apply for jobs. Exploring careers will help you to find these occupations. You'll find accurate information about your work options and places to work. You'll know what type of education or training you need. You'll learn how and where to apply for jobs. You'll make networking contacts who can help you when you're ready to look for work. You'll learn about trends in the job market that can affect your career planning. Do you have a good sense about your skills, interests, and values? If not, go to the Assess Yourself section. Be successful. Go to the Create a Plan & Set Goals section. Small steps can lead to big outcomes.